Tue, Sep 4, 2018, 11:12 pm SL Time, ColomboPage News Desk, Sri Lanka. 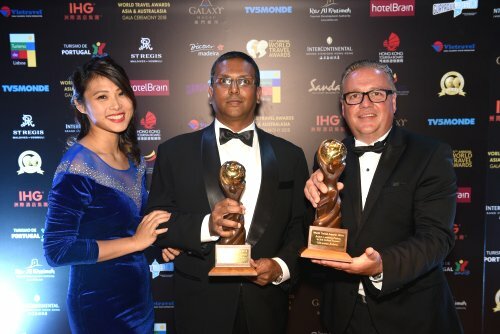 Sept 04, Colombo: SriLankan Airlines, the National Carrier of Sri Lanka and a member of the oneworld alliance was awarded two prestigious titles at the World Travel Awards 2018 Asia and Australasia Ceremony held at InterContinental Grand Standford in Hong Kong, yesterday. Whilst the Airline's launch campaign to Australia titled 'Two Cities. One Spirit' was awarded the 'Asia's Leading Marketing Campaign 2018' accolade, SriLankan managed to defend the familiar title 'Asia's Leading Airline to the Indian Ocean 2018' for the second consecutive year. SriLankan Airlines, Group Chief Executive Officer, Mr. Vipula Gunatilleka said, SriLankan Airlines' emphasis has been on systematic and focused growth in certain markets to reposition the Airline as a leader in the region through product/frequency enhancements and induction of new destinations. "Our consolidated strength in the Indian Sub-continent has allowed us to offer a wider choice of travel to customers across our global network. Impactful marketing communication activations, on the other hand, have been instrumental in cementing the Airline's brand presence in our focus markets. These two awards bear testimony to the fact that our efforts have been holistically effective." SriLankan Airlines' Senior Manager Marketing, Mr. Saminda Perera said, "We, at SriLankan Airlines, are delighted to receive two coveted awards at the World Travel Awards Asia and Australasia Ceremony, this year. Whilst one award reinforces our stature as a leader in the ISC region, the other recognizes the innovativeness and universal appeal of our marketing communications endeavors." The campaign conducted for the launch of new destination- Melbourne, "Two cities. One spirit" stems from a place of honoring and celebrating the affinity between Australia and Sri Lanka. This was aimed to appeal to the Sri Lankan Diaspora in Melbourne and the Australians who are attracted to adventure on the island. The use of location pin as a stylistic element widely recognized by the contemporary traveler was aimed to emphasize on the non-stop connectivity (the point-to-point quality) and that the connections can be extended to onward destinations across the Airline's network. This was a creative collaboration between the Airline and its creative agency, JWT Sri Lanka, and this was the second award bestowed upon the campaign after the First Star award at the Golden City Gate Awards, ITB Berlin this year. Since the launch that took place in October last year, the Airline's operations to Melbourne has been commercially successful and the impactful marketing activations have been a contributing factor to this success. Given the increasing demand and the overwhelming positive feedback of passengers who prefer the convenience of direct flights, the Airline will be deploying its state-of-the-art Airbus 330-300 aircraft on daily direct flights between Colombo and Melbourne from October 28, 2018. The Airline's A330-300s equipped with a range of novelties such mood-lighting, spacious cabins with full flatbed seats in the Business Class, a wide range of entertainment features such as movies, live news and weather updates, sports, music, games and WIFI and GSM connectivity options to make calls or surf the internet during the journey. The second award "Asia's Leading Airline to the Indian Ocean 2018" is a true testimony to the Airline's efforts to establish a strong presence in South Asia and the Indian Ocean markets. Whist introducing new destinations, the National Carrier has also increased frequencies to popular destinations based on the passenger demand. Mr. Perera further added, "We will continue to explore opportunities to expand our reach in the region and endeavor to offer our passengers enhanced connectivity and a wider choice when travelling with us." The Award also proves SriLankan Airlines' stature as the international airline that flies to and from the highest number of Indian destinations, numbering to 14. The Airline also operates to other popular cities such as Dhaka, Karachi and Lahore. SriLankan Airlines also became the international carrier to connect Gan Island of South Maldives to the world, thus becoming the only airline that operates out of two points in the Maldives. World Travel Awards is voted for by travel and tourism professionals and business and leisure travel consumers worldwide, and this accolade recognizes the commitment to excellence that organizations have demonstrated over the last twelve months. The World Travel Awards Asia & Australasia Gala Ceremony 2018 is the region's most prestigious travel and tourism event of the year, which brings together the leading figureheads and VIPs from across Asia and Australasia. The evening also marks the third leg of the World Travel Awards Grand Tour 2018, its 25th anniversary of honoring excellence in the international hospitality industry.